Imagine a 150+ year old house stacked from ceiling to floor with almost every book you can fathom. Now, imagine this plethora of books coming in varieties from mainstream, to used, to quite rare. Finally, imagine this house being haunted by ghosts (or spirits, call it as you may), one of a many being a young girl. My family visited The Book House this past August, and boy, let me tell you, I was overwhelmed with the funkiness of the place (I mean this in the best possible way). From the old book smell, to the overwhelming amount of books piled in one room, it was nerd heaven! Now, I’m not one for being afraid of these kinds of things, but I must say, after hearing that, I felt a bit uneasy. Nonetheless, we hunted through the rest of the house, with the main-floor bookshelves swaying as you walked by, and the second story’s floor sagging in the middle from so much weight. I also took a peek into the quaint room that faced the front of the house where the young ghost of a girl is known to be seen. It was a tiny room with slanted ceilings and a rocking chair with a black cat sitting underneath it. Talk about creepy! (Fortunately for me, I didn’t catch any glimpse of the ghost/spirit, otherwise, I would’ve booked my behind out of that place!!). But the coolest part of the old house was the basement. Walking down the small staircase, we reached what seemed to be more of a 5-foot tall-unfinished room. 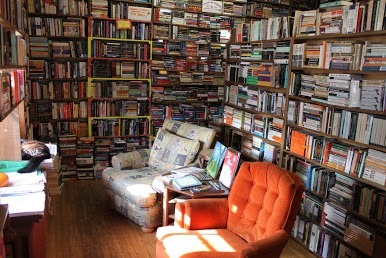 As with the rest of the house, this basement, too, was piled high with books. My mom caught a glimpse of an ancient boiler that was in another room in the basement, which was not filled with books. She thought it looked really neat, and whipped out her phone to capture of photo of it. As she was holding the phone to take the picture, there was this white/filmy “blurb” floating in mid air. Now, we only saw this on the phone, not with our naked eyes. This same thing happened again. 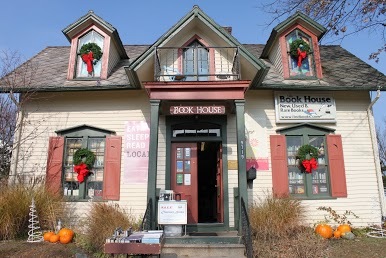 On September 29, 2013, The Book House will face it’s demise. A man bought out the old bookstore and plans on tearing it down, replacing it with a storage unit business. Many locals are very upset about this situation, but after many city meetings, a decision has been made. Thus, the death of the unique Book House becomes a reality.